At Hancock Chimney Service, we believe in educating our customers, to make it easier for them to make a decision that affects their health, safety, and the value of their home. There are many options in choosing your chimney contractor, and this decision is made complex by an incredible amount of misinformation and “cheap” contractors found online. We hope these resources will help homeowners make the right decision. If there are any unanswered questions – please don’t hesitate to call us- we are here to help! Typically built of brick, masonry chimneys include a firebox, where the wood is burned, and a flue, an air shaft inside the chimney. The top of the chimney usually features a crown to deter animals and prevent water from entering the home. All chimneys are equipped with a damper, which is a moving metal plate that opens to release smoke and carbon monoxide and closes to control the temperature inside the home when the fireplace is not in use. Flue liners improve the performance and safety of the chimney by preventing the overheating of the chimney and preventing corrosion. Finally, a chimney cap, a minor and inexpensive product, can save thousands of dollars in repairs, and possibly prevent a fire. Chimney caps keep the animals out of the chimney, prevent moisture from entering the home, and keep burning embers from landing on the roof, causing damage, and even a complete destruction of the home. PREVENT A FIRE — A chimney fire is typically accompanied by dense smoke and a strong smell. These may be loud and noticeable, or at times, barely visible. Even so, these can reach dangerously high temperatures that reach the walls of your home, and ignite anything flammable. Soon, these flames reach the roof and cause complete destruction of your home. The cause of these fires is typically a creosote build-up inside your chimney, which is a by-product of wood burning. Creosotes are basically chemicals formed by distillation of tars and burning of wood and coal. There are many uses for creosotes: from wood preservation to smoked meats. While very positive in medical and industrial uses, creosotes can cause total destruction of a home if not properly cleaned. When burning wood in a fireplace or wood stove, the lack of airflow causes some of the oils in the wood to rise with the smoke up a chimney, where it cools off and sticks to the walls of the chimney flue. This creosote build-up is black, oily residue, which can become several inches thick. As the build-up grows in size, it reduces the airflow, increasing the amount of the oil deposit on the interior of the chimney. Since creosote is highly flammable, it can ignite inside the chimney, and spread through the house by igniting the wood, or by sparks landing on the roof of the home. According to THIS WIKIPEDIA ARTICLE, 73% of heating fires, and 25% of all residential fires in the United States are caused by creosote build-up. 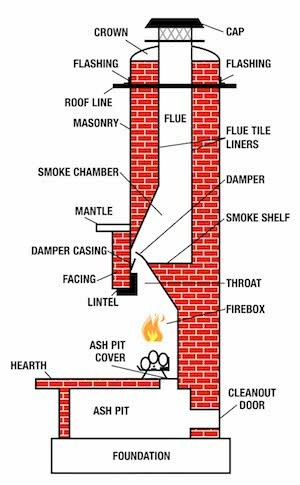 Even if a homeowner is fortunate to avoid a fire, there are still dangers lurking in that chimney. Without proper airflow caused by creosote build-up, or a poorly functioning flue, carbon monoxide escapes into the home, causing headaches, nausea, dizziness, fainting, and in some cases, can be fatal. With poor chimney maintenance & reduced air flow, the smoke can’t draft upwards, and it enters the home, causing the soot to settle on the carpet, furniture, and everything else in the room. These black stains can be impossible to clean, forcing the homeowners to replace their furnishings. Many people assume that the best time to have the chimney swept is in the fall, right before they start using their fireplace. While intuitively correct, spring and summer are usually better! Most reputable chimney companies will have a spike in demand, with waiting lists weeks, if not months, long. Another reason is to allow homeowners time to make repair arrangements, should the contractor find damages inside the chimney. While we repair chimneys year-round, some more extensive work requires above-freezing temperatures. With cold weather around the corner, now is a perfect time to check your fireplace. While the best thing to do is to hire a professional for an inspection, there are some basic assessments a homeowner can perform to identify issues. These are not guaranteed to uncover all problems, but rather give homeowners a start on their basic inspection. A professional can see signs of damage even the most diligent homeowner would miss. Take a look at the chimney from the outside. Can you see any chipped bricks? Is the chimney leaning? Are there any visible cracks or holes? If the chimney is running through the attic, make sure to look there too. Check around the chimney for dampness or stains, which could be caused by bad flashing or damaged liner. If there are signs of water damage- ACT NOW. Call a professional- further delays can add thousands of dollars to repair costs. Check out your chimney cap: look for nests, rust, and gaps in the screen mesh. Check the bricks and the damper. The damper should operate smoothly. Peek up a chimney for signs of creosote build-up. Time to Hire a Chimney Company? We have proudly served West Michigan for over 35 years, and have built a sterling reputation for our quality, integrity, and reliability. Our experienced, certified technicians have achieved a professional level of knowledge of codes, standards and practices. Do they have current online reviews & testimonials? We take great pride in providing our customers with great service, personal attention, and skilled craftsmanship, and we work hard on delivering an amazing experience. Click the button below to read real customer reviews. Do they have unresolved complaints with consumer protection agencies or the Better Business Bureau? We have been accredited by the Better Business Bureau since 2001, and are proud to receive an A+ Rating. Are they insured to protect your home against accidents? We are insured to protect your home from damages and can provide the full policy to our customers upon request. Many “chimney companies” claim to be insured, meaning their automobile insurance- make sure to clarify their coverage when shopping chimney contractors. Is this company licensed to perform the work? Our technicians are licensed and certified and are up-to-date on the latest techniques, and methods. Chances are, the estimates received will range in price, and each company will present you with options that contradict each other. How do you decide which company is the right choice for you? We can help you cut through the confusion. Keep in mind, price alone cannot be the deciding factor, as there are many variables that can affect your safety and the safety of your home.Any serious and reputable chimney company will support the estimate with documentation and photos. Make sure to ask them to demonstrate the need for the service, and ask for different solutions. Chimneys may work seemingly well and still have detrimental defects and issues. Most homeowners just want to make sure their chimney is safe. Some homeowners want to make sure that even the smallest issue is fixed, while others take a more relaxed approach, and just want the chimney to operate until it is unsafe. The experts at Hancock Chimney Service understand that circumstances may force some homeowners to only handle the absolute “musts” now, and fix the rest at a later time. We will provide a detailed explanation of the necessary services and the consequences of leaving some of the issues to be addressed later. Keep in Mind: Chimney Sweeping Is an Unregulated Industry! Strange, but true: even though improper chimney maintenance can often lead to a devastating fire or even death, there are no regulations for the chimney sweeping industry. Sadly, there are many “scam artists” with a brush and a ladder, that entice homeowners with low rates, and present them with the need for costly repairs, often accompanied by statements that would lead the homeowner to believe that their lives are endangered. Be sure to ask for references, licenses, certifications and other proof of legitimacy and experience. Oftentimes, memberships in the National Chimney Guild and other trade associations, require members to be properly trained and adhere to strict code of ethics. Be wary of phone scams and low, discounted prices. Check their memberships and certifications. Expect professional attire & behavior. Expect prompt & reliable service. Check their insurance & licensing. Read reviews & check references. Make sure to hire a LOCAL company. Check their identification- don’t let strangers into your home. Ask for proof of damages / required work IN WRITING. Don’t hire a company that subcontracts their work.